In 2015 and the first months of 2016, violence by Boko Haram caused thousands within the Lake Chad region of Chad to flee their homes. This includes, on a lower scale, a wave of refugees from neighbouring Nigeria. In addition, the Chadian government’s response has forced tens of thousands of residents in the Lake area to leave their villages. According to figures released by OCHA in October, there are 117,873 displaced people in the Lake region and 6,994 refugees, over 5,000 of whom have been living in the Dar Es Salam camp since the beginning of last year. Although violence and the number of people fleeing have since decreased, many of those who have settled across the Lake region have lost their sources of livelihood and belongings. The Lake Chad Basin is a desolate region that suffers from irregular and insufficient rainfall, poor soils and high temperatures. It is totally landlocked, far from the sea and from major markets and transport routes. It is also a poor region, affected by chronic food insecurity. View of villages near Bol, the capital of the Lake Chad region. Nigerian refugees living in Dar Es Salam refugee camp, Chad. A young woman is carried to the MSF mobile clinic after travelling on a horse and cart for over 30km. She is being checked by MSF staff before being brought to the main hospital in Bol from Yakoua town. Mobile clinic set up by MSF at the Tataveron IDP site, Lake Chad. A young baby being weighed at an MSF mobile clinic in Yakoua town, near Bol in Chad. Hawa Baguani, a 24 year old IDP, now living in Tataveron, Lake Chad. “We left Djilom under the threat of Boko Haram in November 2015," she says. "Boko Haram attacked our village in the night and we started running. "They are killing without mercy. They kill people like animals. "We felt like we were prisoners so we decided to leave and come to settle where we felt safe. Since November 2015, displaced people have settled in the Djameron site. Boko-Haram attacks in the area of Lake Chad in the west of the country forced them to flee their homes. This has affected host communities, as they need to share their scarce resources with them. A young man is held by his relatives inside the MSF clinic after falling ill in Djameron. Between January and October 2016, nearly 11,000 medical consultations were carried out in MSF mobile clinics in Djamerom. Currently, the most common medical conditions seen in MSF clinics are linked to the difficult living conditions and the lack of access to clean water. Men sit inside the main chief's hut in Djameron. Djameron is now home to the entire village of Kobe - 6,000 people who fled from Kobe had made their way through the lake to an area they deemed safe. Kobe was a village mostly comprised of fishermen. Now they have no choice but to live in the middle of the desert. The MSF no weapons sign at the mobile clinic in Tataveron IDP site, Lake Chad. 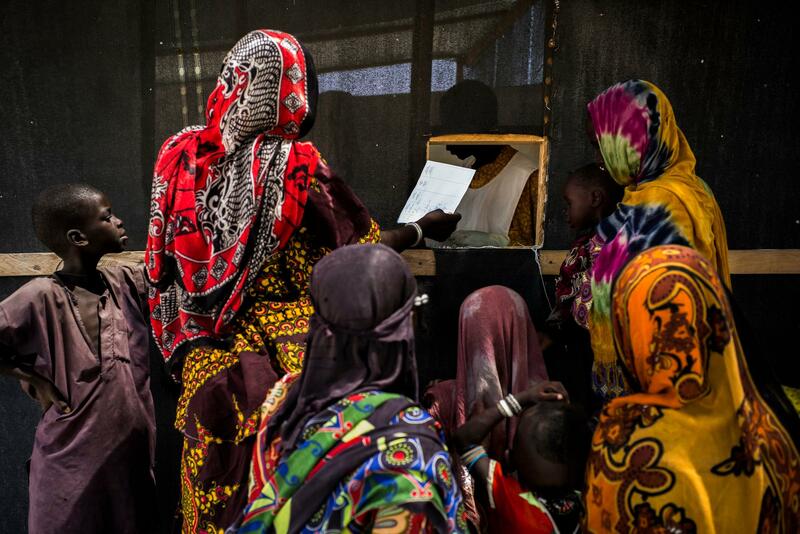 Women wait for medicine outside the MSF clinics in Bol, and Forkoloum. Forkoloum is home to 2,000 people, and has since the end of 2015 also been home to some 16,000 internally displaced people. In Yakoua, a town seven kilometres south-east of Bol, MSF is running a mobile clinic with a particular focus on mother and child care. Between January and October 2016, the MSF team provided nearly 20,000 consultations, of which 5, 637 were for children under five. One in ten children in Chad will not make it to their fifth birthday. Malnutrition is one of the biggest child killers in this country. A group of young and old men sit together as the sun goes down in Kaya, a camp with about 1,200 inhabitants. Many have left Kaya because the lack of food and decided to go back to their villages located on Lake Chad’s islands. A one year old boy with gangrene and who is HIV positive, has his wounds redressed after his surgery inside the regional Hospital in Bol, Chad. A young boy stands on a pirog, a wooden boat, after fishing in the lake. The lake is near Kaya, an internally displaced persons camp with about 1,200 people near the town of Bol in Chad. Many people drink water directly from the lake, risking illness. Halime, 20, an alleged Boko Haram suicide bomber, inside a tent of her aunt's near Bol, Chad. She and her husband joined a training camp and were indoctrinated by the terror group and their teachings. After her husband blew himself up and killed numerous of civilians, the group urged her to join him in paradise. On 23 December 2015, allegedly heavily drugged, she joined another suicide bomber in Birim to commit a terror attack. Things did not go as planned. The male suicide bomber was killed and four civilians died, Halime survived. She lost both her legs and her unborn baby. After being taken into custody and beaten, authorities ended up letting her go. Confused and ashamed, she sits all day in a small tent on the outskirts of a village. A young boy with tears in his eyes in Kaya, an internally displaced persons camp near the town of Bol in Chad.